If you’ve never heard of an “offsite return to work program” or “pharmacy benefit management program,” this is the perfect tool for you to help your clients. 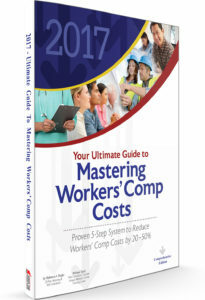 Your Ultimate Guide to Mastering Workers’ Comp Costs – Reduce Costs 20% to 50% is a 250-page guide that helps risk managers, agents and brokers assess their company/clients’ workers compensation programs, design program materials, roll out a program to the organization, and monitor and manage the program once implemented. This is a hands-on practical manual written by a national expert on workers compensation cost containment with over 25 years of experience helping companies to reduce losses by as much as one-half. The book guides users through each aspect of a workers’ compensation program, to learn step-by-step a variety of techniques that show organizations exactly how to reduce workers compensation costs. Hard-hitting material based on field research shows risk managers, agents and brokers how to help their company/clients increase efficiency and save money. The principles in our guidebook apply to any state, jurisdiction, or country. No matter where you are trying to train risk managers, this book will work for you! Risk Managers and Safety Directors use this book to train supervisors in workers compensation claims management. They learn more about their area of responsibility – post-loss cost containment – adding to their overall knowledge. This book is also used to get management commitment in rolling out a Return-to-Work program, one of the biggest cost savings areas relating to Workers Compensation costs. Brokers, Agents, Adjusters, and Consultants use this book for prospecting and to learn about specific aspects of cost containment; and by passing their knowledge on to their clients. For example, when discussing how to develop a Return-to-Work program and a client asks about “off-site return-to-work programs,” the broker quickly finds the section in the book, reviews it, and passes the answer on to the client, along with a copy of the cost containment book. The book becomes a “lesson plan” tool. Producers and Account Executives give the book to prospects during formal presentations to illustrate how their company is on top of workers compensation issues. The book also makes a good client gift. In addition to insurance companies, reinsurance and excess insurance companies use our book internally and for distribution. Vendors such as doctors learn how their service might fit into the workers compensation marketplace, what is important to employers, and what they look for in medical services. Human Resources find it useful in bringing new hires up to speed very quickly.